Back when I was a kid I had something of an obsession with Herge’s Adventures of Tintin – or Les Adventures de Tintin, since the first book I ever saw my parents found in a small bookshop in a little French Belgian town. Growing up we didn’t have much money to throw around, so every week my mother would take me down to the local library to grab another Tintin story, and over the years, despite there being only 23 books to choose from (24 now, but the last was published posthumously long after I’d grown out of short pants) I never failed to return week on week to read and re-read these wonderful stories. In later life (read: after my love of comic books had bee overshadowed by my love and girls, bars and chain smoking) I returned to the comic books (I refuse to call them graphic novels) to discover a new aspect that I’d never noticed: the incredible fashion sense of the characters. Discounting the three quarter length pants, a detail presumably included to highlight Tintin’s youth, this suit is pretty much the same worn by David Tennant in his turn in Doctor Who. Cool, raffishly crumpled and matched with a perfect blue shirt and tie combination. Remi knew what worked. Anyway, I’m going a little off topic. While Tintin’ clothing was usually awesome I was always drawn to the outfit of Captain Haddock, the short-tempered drunk with a good line in curse words. 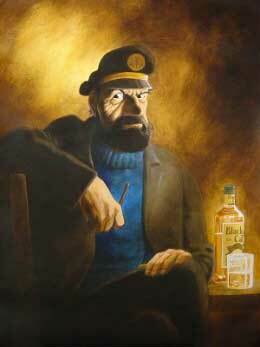 Haddock’s appearance is almost Hemingwayesque; he’s usually seen in various states of profanity-laced drunkenness, decked out in his beaten-up captain’s uniform matched with a thick beard and chunky blue turtleneck sweater. This is clearly a man who’s seen too many stormy seas and too few calm waters. He’s a hard-bitten, salt of the earth, pissed up, hairy oaf, short on brains and long on booze. Even so, he looks damned cool, and a lot of that cool comes directly from the thick blue sweater that’s kept him warm through those cold nights on the ocean all these years. There are precious few options for chunky turtleneck sweaters outside of vintage shops, but we managed to find five thick knits that perfectly evoked the Captain Haddock vibe. You can take a look at our choices through the links above, but here’s our favorite by far (H2H, $36). We absolutely love the knit on this classic sweater, and matched with a dark jacket the look would be spot of for the hard-bitten Captain (or Hemingway character who’s seen too much of the world). 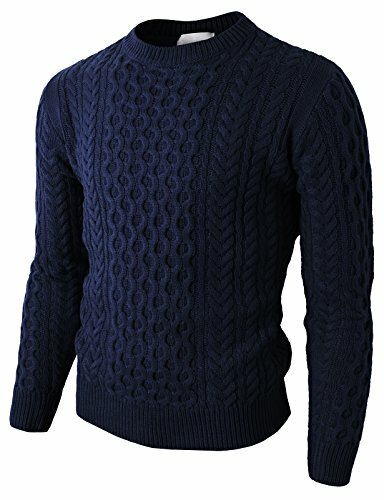 Here is another one sweater from H2H. By the by, it’s great to see that Spielberg hasn’t tried to play too much with Captain Haddock’s outfit in the new Tintin movie, The Secret of the Unicorn. The original book was centered around Haddock, so it’s a relief to see him appearing in all his drunken glory once more. 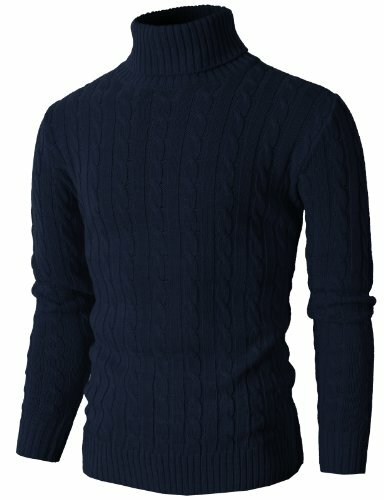 I had no idea you could even buy a Haddocks sweater. How cool is that? I am a huge fan of the TinTin Cartoons and the new movie. It was so fun to see haddock come to life on the big screen and I can see myself snuggling up in this sweater.